Investment activity picked up more strongly than expected in both the private and the public sectors, pushing GDP growth to 4.3% in 2017. 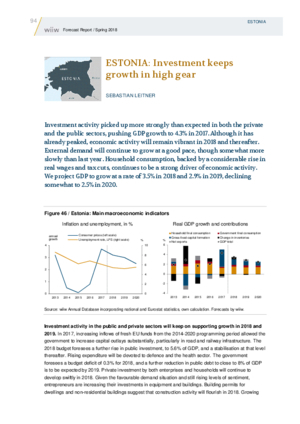 Although it has already peaked, economic activity will remain vibrant in 2018 and thereafter. External demand will continue to grow at a good pace, though somewhat more slowly than last year. Household consumption, backed by a considerable rise in real wages and tax cuts, continues to be a strong driver of economic activity. We project GDP to grow at a rate of 3.5% in 2018 and 2.9% in 2019, declining somewhat to 2.5% in 2020.